Founded in 1904, El Table began as a small table by an elevator that catered to the needs of hungry students. That original enterprise has since expanded into an organized student co-op, and is currently nestled in the basement of Founders Hall. Members of the co-op (affectionately referred to as “El Tablers”) are proud proponents of El Table lore, and even put together a birthday party (complete with a serenade by the Wellesley Blue Notes and free cake with any order) on October 1. The cozy basement space was packed with comfort food-craving students during lunch hour as El Tablers zipped back and forth from the grill to the coffee pots by the register. By the end of the afternoon, no croissant was left uneaten and no stomach left questioning whether it was possible to eat another cookie. 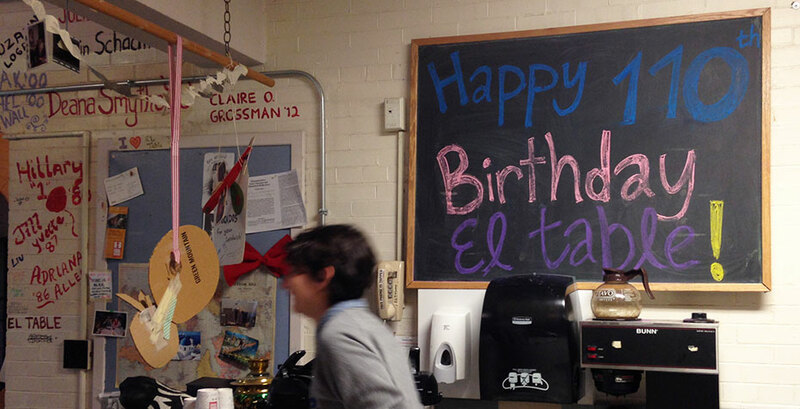 Claire Verbeck ’16 concurs that El Table provides a community for more than just its membership. She says, “There's something very comforting about entering a space and knowing that it's entirely maintained through the mutual understanding and effort of other students. Co-ops more generally, in my opinion, help to unite the campus in ways other establishments and spaces cannot, [and] within co-ops, there exists the opportunity to learn skills like teamwork and compromise. It can be difficult to practice such skills at Wellesley, when one is constantly working on academics... working at a co-op can be a great balance to the solitary nature of schoolwork." Adds Sartu Taha ’16, "[Because of El Table] I'll always have incredibly fond memories of Wellesley that are completely non-academic, which is amazing. I also know that I belong to a special community with a rich history that has been around for decades and will hopefully continue to be around for a really long time." Indeed, decades of El Table members have left their mark by signing their names on the walls between and around the colorful murals and decor. Whether at work or play, Wellesley students find community in a variety of spaces. Past, current, and prospective students, as well as faculty and community members, are all welcome to stop in at El Table for a hot cup of chaider (hot cider + chai tea, created by Xie) and a toasted chocolate chip cookie whilst they succumb to the homey aura that is El Table. Tip: Seek out the signature of former United States Secretary of State/El Tabler Madeline Albright ’59 on the wall!